China's far western Xinjiang region on Thursday put into trial operation its second railway mainly specializing in transporting coal to other parts of the country. A freight train loaded with 3,700 tonnes of coal left the Naomaohu station in Yiwu County of Xinjiang for the Hongliuhe station in neighboring Gansu Province. The railway currently has an annual coal transport capacity of 39.5 million tonnes. In the long term, the annual capacity could rise to 150 million tonnes, helping turn Xinjiang's energy resources into economic benefits. 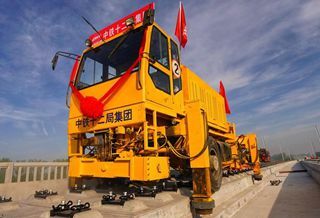 With a private investment of 10.9 billion yuan (1.6 billion U.S. dollars), the 435.6-km-long railway was built by a subsidiary of Guanghui Energy Co., Ltd., according to the China Railway Urumqi Group Co., Ltd.
Construction started in March 2012 and lasted for six years. The trial operation ended the history of no railway service in the coal-rich regions of Naomaohu and Santanghu in northeast Xinjiang and will help send local energy and agricultural products to other parts of the country, said Shang Jiqiang, president of Xinjiang Guanghui Industry Investment Group Co., Ltd.
Xinjiang is rich in coal but before the opening of this railway, its only railway specializing in transporting coal outside of the region has long been unable to meet its demand. In 2009, local authorities proposed to build another two to supplement the artery route.